Why did I cry? 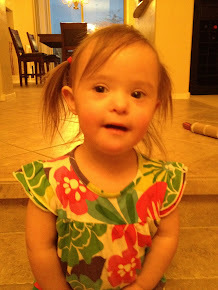 Someone asked my nanny if Ella had Down syndrome. To be fair, the person that asked has a 4 year old with Down syndrome and may have been tipped off by the preschool teacher that one of the kids in the class (Reed) has a baby sister with Down syndrome, but nonetheless, her asking made me cry. I know, I am most likely over-reacting as this woman is probably tuned in to what Down syndrome babies look like because she has been there and done that and she was probably so excited to meet Ella and share her knowledge with us, but for some reason it made me sad that she walked right up to Roxie and asked if Ella had Down syndrome. I think I have done a good job adapting to our new life. I get that Ella has Down syndrome, I get that she may live with us or live only semi-independently for the rest of her life, I get that she won't be President and she probably won't drive a car. I think what made me cry was thinking that other people might know all this about her already by just looking at her. I don't want people to look at her and because she looks a little different discount her, her feelings, her abilities. I want them to give her the same chance they would give anyone else and well, the truth is, this might not always happen. I don't think that the woman at preschool falls into this category at all and I don't think this is what she was doing, but hearing Roxie tell the story made me think about what we will be dealing with for the rest of our lives. People who automatically assume Ella isn't as "good" as them because she doesn't look like them. Writing about it now, it seems so silly, I took one comment about Ella's day from Roxie and made it into something so much bigger, but hey, I can't help my feelings and I was already tired last night and so... I cried.. The best part... as I was crying my song (Daughtry's Life After You for those of you new to the blog) came on. Like someone out there was slapping me in the face as I was crying telling me to get over it and get on with cooking dinner. Let's move on... 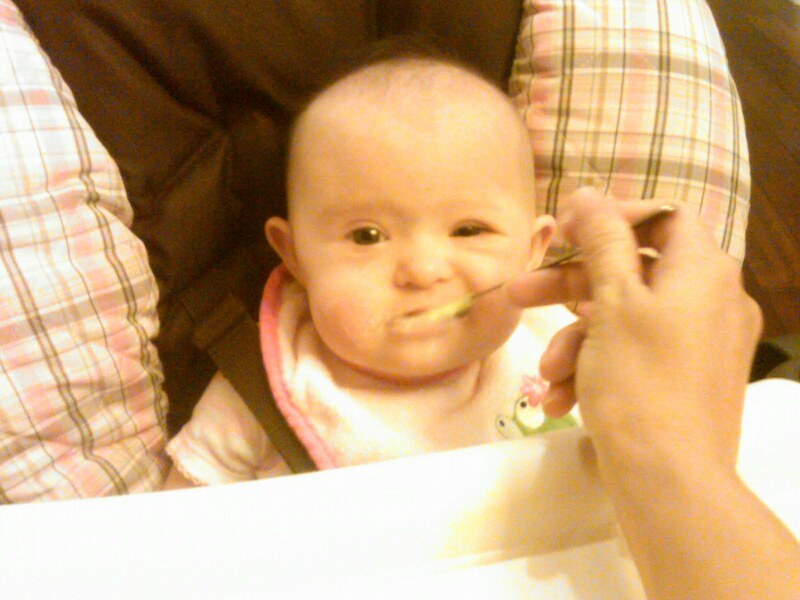 Yes, I said she rocks at eating solids. Tonight was the first night we tried it. We have been waiting as she is a wee bit behind in the sitting up thing and I didn't want to rush it until her head control was better, so we waited until now and well, she did wonderful!!! We gave her rice cereal and she ate the entire bowl. Let me tell you, this little girl had a blast. She would get so excited when the spoon was close to her mouth that she would shake. I loved feeding her and I loved how into it the whole family was. Ryan was by her side the whole time encouraging her and wiping her face and Mike was taking pictures and Reed was talking about Cheetahs (4 out of 5 of us isn't bad...) and it just felt so awesome. Everything she does is so much more important to me because I know she has to really work at it. I was excited when the boys ate solids for the first time but it was more of a "oh, look how cute Ryan is when he has rice cereal all over him, and me and the floor". With Ella you are excited because you know it is hard for her little muscles and her tongue to all work together but she keeps trying and by the end, I swear she was a pro. I was a proud momma tonight. We are working really hard on getting her to laugh and sit up and use her arms more. She can laugh, I know she can, but she just chooses to show us her giggles with big smiles instead. The sitting up thing... Well, Ms. Ella needs some more strength in those ab muscles. She is a bit wobbly but we are working on it. I know I talk about her therapists all the time, but honestly, Tess has been the biggest blessing to us. She knows how to work with Ella to really make her "work out" without angering her and she is positive but realistic. 3 months ago I really didn't get why you start therapies so early, but now, I get it. OK, off to bed. Mike and I realized that we won't ever be skinny again by just sitting on the couch so we are waking up early to work out. I wish I could do the boot camp thing but there isn't time in the morning with Ella's therapies starting so early (we had to move them even earlier in the morning to make sure we could get Mr. Cheetah and Ryan to school on time) so I will be in front of my TV tomorrow at 5:00 AM watching Denise Austin tell me my buns are great but she can make them fabulous. Good night! Great blog! Ella is a doll! I have a 6 year old niece who has Down syndrome and so I know how hard it is to learn all of the new things you need to learn to live in this new world and I think you are doing a wonderful job. One thing that I've noticed in your writing though is that you often say "Down syndrome baby(ies)" and so I just wanted to let you know that we try not to say it in that way because it's then like that is the defining thing about them. They are babies and children in their own right, they just also happen to have Down syndrome so the better ways to say it is "babies with Down syndrome", "children born with Down syndrome" or "babies living with Down syndrome". You get the idea... :) A small difference in wording but it helps to change the way that people think about Down syndrome, it becomes not an "affliction" but just one more thing about that person, just as if you would say "children born with brown eyes". Glad to have found you and your adorable family! don't underestimate your daughter, she needs your full belief and support to become the best she can! Are you doing Nutritional Intervention? Very important. Check out http://einstein-syndrome.com/2009/04/11/top-15-things-a-new-parent-should-know/ for an introduction. Join DSTNI yahoo group. And of course the excellent Listserv also called Einstein Syndrome. Check out my 18 month old, she's not walking but she is a mean crawler...and she's saying some words, too, and is also a great communicator. http://vimeo.com/13259899 Oh DO join the COMMUNICATING Yahoo group, Dr. James Macdonald's methods really work with late talking children, and are not what you'd get with standard speech therapy! What a great list. Preverbal skills are very important, turn taking, balancing and matching. You are the best teacher for your baby, and the first year is the most important. Do not wait!